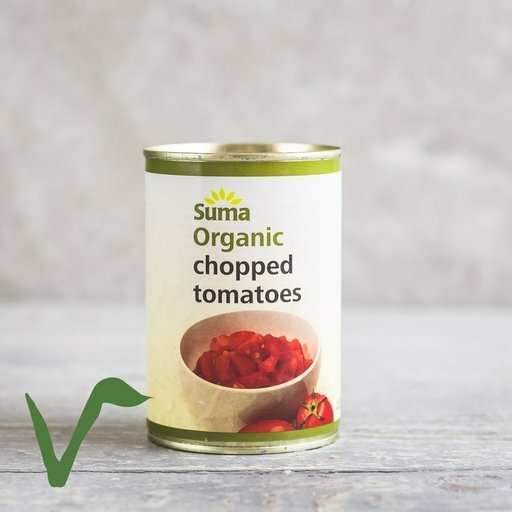 Organic tinned chopped tomatoes from Suma were the first ever sold, and are still the best we’ve tasted. A deep ruby colour, with a rich, sweet, properly tomatoey flavour. Nothing added – just tomatoes ripened in the Italian sun. Organic tinned tomatoes form the backbone of many comforting meals. Try them in our recipes for sweet potato jacket & black bean chilli, smoky quinoa stuffed peppers or fennel and tomato risotto. For a perfect, simple pasta sauce, simmer tinned tomatoes, a peeled halved onion and a generous knob of butter for 45 mins – and that’s it. Unopened chopped tomatoes can be stored indefinitely. Once opened, don’t keep any leftovers in the tin – turn them out into a covered bowl and they’ll last a couple of days in the fridge.